Richard Hughes is Distinguished Professor of religion at Pepperdine University, Malibu, California. He has had a long career teaching in a number of church-related colleges in the USA. 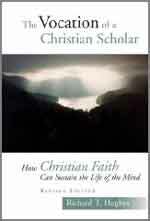 The subject discussed in this book (most if it previously published in 2001 under the title that sums it up, 'How Faith can sustain the Life of the Mind') has been a dominant concern of his for many years. The present article begins as a straightforward review, but I am asked to say something about the ways its subject has worked out in my own comparable yet rather different life. In between I shall describe the major differences between the American situation as presupposed by Richard Hughes and the situation in these matters in the UK, at least as I have experienced it. Hughes may be described as a wide-minded member of the (surely strangely named) 19th-century denomination, scarcely found in the UK, the Churches of Christ. That is his spiritual home, but he knows intimately and values the Lutheran, Calvinist and Anabaptist traditions, each with its own Christian emphasis and each contributing to the Christian experience as Hughes has known it. He is especially indebted here to the Lutheran tradition with its emphasis on the human incapacity for salvation and on justification by faith, and the Anabaptist and Mennonite tradition, stressing sanctification, the steady obedience required in the Christian life. Oddly perhaps, Anglicanism plays no part in his spectrum - it might have served his cause very usefully. He does, however, include Catholicism as one element in his typology. This multi-sided wisdom Hughes has arrived at in the context of an academic life-time, teaching religion to many generations of students in a number of different colleges. His own Christian experience has formed his teaching and he tells us something of the ways he has found to convey his convictions to them. He has felt impelled to stress both the Christian way of life as a constructive discipleship ('sanctification') and the constant inadequacies of our understanding of the world and of Christian truth, as of our capacity to live for God always in total dependence on his unmerited gift of acceptance ('justification'). So he is no Christian know-all, no pulpiteer secure in his own understanding of God: truth is given but equally eludes us. We are always on the way. To behave as if we have arrived is to claim a perfection of life and understanding which is not given here and now - and which is inimical to the life of the mind, fallible and incomplete as it always is. So he is glad to reach out to let Luther serve to direct him to the Enlightenment values of standard modern scholarship, including theology: truth for its own sake, evidence dispassionately weighed, freedom from dogmatic controls. How far Luther quite leads us to this point may be debated! Mostly, Hughes' account concerns his vocation as a teacher and the life of church-related colleges of higher education as he has experienced them. He says little about the work of the scholar when not teaching students: researching and writing in the relative privacy of his own study and his own head. I suppose we can take it that the same principles apply, for writing helps to form the teacher. In the mainstream British university departments (and to some extent in a number of the theological colleges whose degrees they now often validate), there is, perforce, a broad acceptance of Enlightenment assumptions and values: you follow the evidence without religious constraints and you go for truth for the sake of truth, with all the movement to which that leads. There is hardly any deliberate attempt to relate the syllabus to religious convictions and problems, except by way of examples: that is work for the chaplaincy or for lecturers well outside the class-room. A cynic might say that in England, religious practice is rarely concerned with theological questions! In England, any attempt to bring religious confession into the classroom is likely to meet with some dismay or even embarrassment, except as a possible option in ethical or philosophical discussions. Numbers of students reading theological degrees now have scant religious formation behind them and scant formed belief: they have developed an interest in the subject at school and choose to study it for a wide variety of reasons. Is there and up-side to the apparently negative British (or is it chiefly English?) situation with regard to the concerns which Richard Hughes addresses? Well, it is arguable that, since we do not inhabit a society where religious authority holds sway, there can be no question of public educational institutions and those they employ, even in theology, laying down any kind of line, however benevolently. We do not wish to stimulate the building of denominational fortresses: free markets are, in this matter, highly desirable, all the more so in a society where Christian religious practice is so reduced and exists alongside most of the leading world faiths. It is of course arguable that where faith is weak, fortresses have a role as places where faith can be preserved through lean times. Then the danger is that narrow dogmatism prevails, and serious concern for the open consideration of evidence and honest examination of texts go by the board. In any case, our concern here is not with church life in society at large but with educational institutions - the imparting of knowledge and modes of thought to those who possess them not. In this context, position-taking and decision-making are premature. Similarly, there are advantages in teachers keeping students guessing about their own convictions and views: let the students work at the issues themselves as they arise. Maturing is a slow process - and all that can be done to prevent its conclusion is desirable. When I reflect on these matters in my own life, I may begin with an oddity. Over much of my career, partly by accident, the study of the New Testament has been my main academic concern, in both teaching and writing. Now in most British writing in this area, it is, I think, virtually impossible to guess at the religious allegiance, if any, of the scholars concerned. I can identify one or two who seem to have decided, for dogmatic reasons, one assumes, that Paul was right on a complex doctrinal issue, and seem to force the argument to support him. But I can read most leading scholars from end to end and have no inkling whether they are people of faith or not. Not surprisingly, it is a different matter where ethics and dogmatic theology are concerned. But there is some irony in the study of the New Testament, central to the Christian faith, being so free of bias in the interests of religious convictions or prejudices. One might even say that the freshness of the NT is indestructible! This happens to conform to my own belief that this invisibility of doctrinal position is right. But there is also the conviction that provisionality in judgment is necessary in all human thought about God - and particularly necessary where, as in biblical studies, matters of history are concerned. In these areas, new ways of approach and sometimes new discoveries bear on interpretation and produce real advances in understanding. But there is a deeper question: why approach these studies from a position of faith at all? And what kind of faith can it be if it is ready to stretch and modify so readily? Well, all of us live with the life we have received. No good going far down the road which says: if you had been brought up a Muslim or an atheist or had different teachers, would you not have been a Muslim or an atheist or whatever? Of course we lead the life we have been given and, to a lesser degree, chosen. We cannot live in more that a single skin, more than one time-frame. But that does not invalidate the tendencies of mind one has developed. So I was reared in a setting where only Anglicanism, of a fairly un-dogmatic variety, was on offer, and, apart from a period of adolescent unbelief (or was it really just low morale of mind and soul? ), so I have continued - with constant and often imperceptible modifications. But, if you find yourself working as an academic teacher and writer, what does such an Anglican really 'believe'? It is not surprising that some take one as scarcely 'believing' at all! Well, one 'receives' the traditional Christian faith, but much more significant is the question of how one receives it. First, certainly as historically conditioned at every turn not only in the mode of understanding of a particular item of faith, such as the Chalcedonian Definition whose context has shifted constantly as frames of reference have shifted and even fossilization has supervened; but also in the content of faith as old items, once powerful, fade out of sight, defying credulity, even when formally asserted (e.g. eternal punishment) - it is as if, whatever anyone says, be it Pope or Bible, such an item becomes incredible, perhaps recited but in fact ignored. Not that any authority can easily admit it! Or else much valued beliefs, for which people once died, themselves die off in that nobody can any longer quite 'use' them: doctrines concerning the Eucharist rapidly reach this position as fresh ways of seeing and experiencing the Eucharist seize the Christian consciousness. Equally significant for me is the essentially poetic, image-laden character of theological statement - greatly ignored by formula-making authorities down the years. We are therefore doomed to the charge of mis-sorting if we take the poetry for prose, and the mode of our religious speech and the movement of our religious heart are then rootedly mistaken. There is, in our talk of God, always elusiveness, always imagery that shifts before our eyes. This leads to the underlying primacy of spirituality and what would once have been called the affections of the soul. The detached quality of biblical studies means, at its best, allowing the divine awareness present in the Scripture to be perceived - and the twin loves of God and neighbour to shine out as the necessary pursuits by which all religion, all life are to be marked.